I think that I want to repeat it in the future as it is solid and usable without rivaling other companies' things. This review is about item#27107587. We use for DC-2 type R. I use a large capacity in feeling capacity up, but installation can be done by normal replacement, and there is no leak. Because it is the price that can be done for every oil change, it is convenient. This review is about item#9600753. According to the manual of the car, it will be replaced every 15,000 km and it will be about 3 times, but there is no problem. There may be something better than other products, but for the time being we are satisfied. This review is about item#27107702. The cost performance is quite high at a price of 1/3 or less compared to the genuine. There is no problem at all, so I repeat it. I used genuine or HAMP for Honda cars, but this time I also used this monotarou filter. It works well and there is no problem at all. This review is about item#27107623. 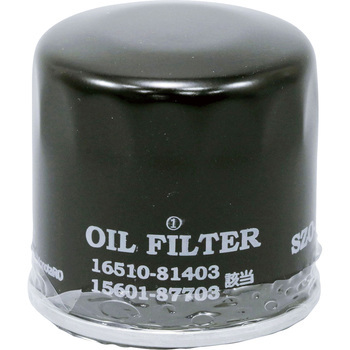 I used because it was equivalent to a genuine product, I needed a little more oil because the capacity was a little large, but I increased the cooling effect so I bought it for the next time I was satisfied. This review is about item#37569402. As it is nearly half the price of a pure product, it is freely spared and frequently replaced at the same time with each oil change (up to once a year). That's why I'm convinced that the engine is doing well and you're reducing the cost of car maintenance! This review is about item#27107648. When changing the oil of Hijet Cargo, use it twice. We use it a lot of times including the previous vehicle, but there is no trouble once. Because oil change and brake pad change are done by oneself, Monotaro brand is cheap and saved. The oil element has also been replaced as the oil is replaced. We made element removal and were able to attach without problem. I want to buy it again next time because the price is cheap. Installed on Suzuki Wagon R mh21s. It can be used normally without any problems. Because it is cheap, I change it every time when changing oil.